Some cuisines are more friendly to vegetarian diets than others, and Japanese vegetarian cookery is one of the top forms. If you are looking for a way to add delicious flavor and variety to your usual vegetarian diet, consider these ideas for some Japanese inspired flair. Vegetarians often face a quandary when picking their meals. Many favorite foods and ethnic specialties can be adapted so that they are vegetarian friendly, but the change in the recipe sometimes means sacrificed taste. None of that is a worry when it comes to Japanese food. Japanese cuisine is predominantly vegetarian, in its pure form anyway, so vegetarians don't have to give up on flavor to stick to their dietary choices. The reason for the vegetarianism in Japanese cookery is because Buddhism has such a big influence in Japan. But there is a word of warning: Japanese cooking often uses fish, so not every meal is acceptable to a vegetarian. Vegetarians that choose to eat fish have a higher selection of choices in Japanese cookery. Miso soup - A simple broth soup made of dashi and miso paste. Sometimes veggies and soy tofu are added. Onigri - Balls of sticky rice, usually bound together with a piece of seaweed and flavored with bonito flakes and miso. Tofu - Tofu is a must in Japanese cooking, and is prepared in many different ways. Sometimes it is grilled, sometimes it is deep friend and served with a sweet miso dipping sauce, and sometimes it is pan fried and served in any number of light sauces. Simmered tofu topped with green onions is also a popular favorite. Egg dishes - If you are a vegetarian who eats eggs, there are many Japanese delicacies to try, from egg pancakes to omelets to sweet egg custard. Noodles - Noodle dishes play an important role in Japanese cooking. Udon noodles, which are made of white flour, and soba noodles, which are made of buckwheat flour, are used in soups and sometimes mixed with veggies, tofu and sauces to form a dish. Sometimes the noodles themselves are deep friend and served with a sweet mirin dipping sauce. Seaweed - Most people are familiar with seaweed used in sushi, but it has many other uses in Japanese cuisine. You'll find it in seaweed and cucumber salads, seaweed based soups, and deep fried and served on its own. Pickles - The Japanese are known for their pickled vegetables, and they can make great additions for other meals. Some pickles are sweet and some pickles are spicy. The most popular veggies to use in pickles are carrots and cucumbers, though most recipes allow for a little bit of creativity. Stews - There are lots of rich stews with veggies and tofu. But sometimes seafood like oysters are added, so be sure to ask if you want a truly vegetarian soup. Some soups are served alone, and some are served over noodles and rice. Rice - Rice is a part of almost every Japanese meal. Sometimes it is simple served alone, sometimes with a light sauce, and sometimes it is served with other vegetables, tofu, and other cooked foods as a base. Edamame - These young soybeans are served steamed and seasoned and make a healthy, low calorie, addictive snack. The Black Moon - Offers recipes and plenty of explanations about the culture behind the cooking. Fitness and Freebies - Japanese cooking is extremely healthy, and recipes can often be found on health food sites. 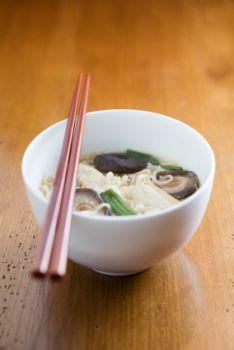 Recipe Tin Eats - This site goes a step beyond and offers 21 vegan Japanese recipes. A good Japanese cookbook is great investment for a vegetarian as well. Amazon offers a large selection. Recipes that aren't vegetarian friendly can often be converted with just a few changes.